Mats shared his method of aligning, and positioning all the LEDs on his clock in a perfect circle. 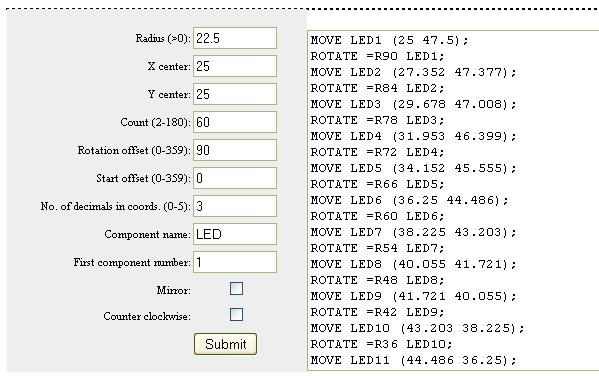 He wrote an online PHP script that outputs Eagle commands that position, and rotate the LEDs depending on the parameters you enter into it. I have written a php script that generates a bunch of moves and rotates to move parts in circles that I use when I want something spaced evenly in a circle. Enter parameters, hit submit, copy the code and paste into the command area in the board editor. This entry was posted on Monday, August 20th, 2012 at 3:00 pm	and is filed under Eagle, tutorials. You can follow any responses to this entry through the RSS 2.0 feed. You can skip to the end and leave a response. Pinging is currently not allowed.